Lovingly handknitted in Peru by skilled artisans. 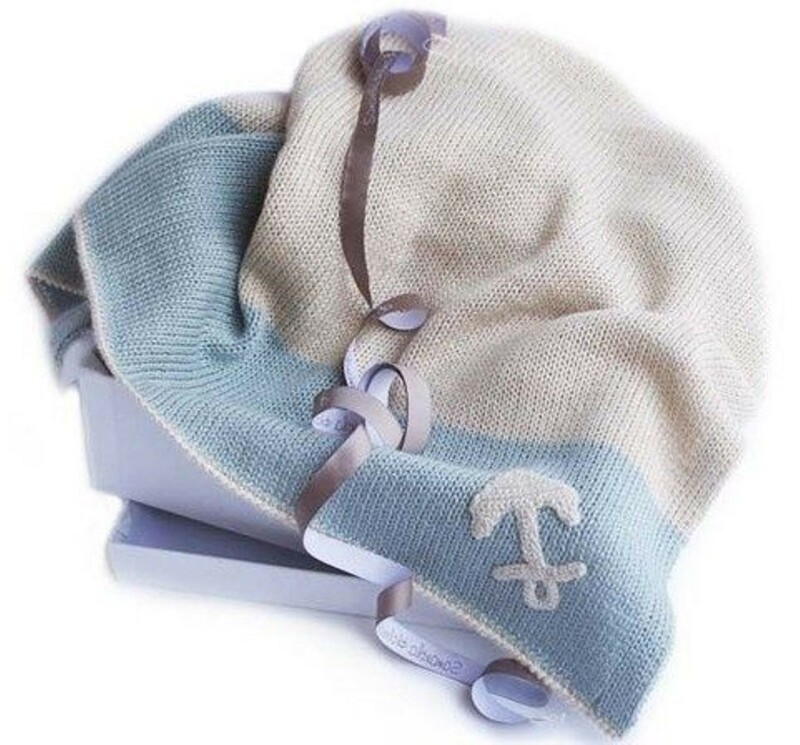 This beautiful crochet anchor pale blue and ivory baby blanket is made from 70% baby alpaca and 30% bamboo. Perfect new baby layette, baby shower or christening gifts. For the perfect christening or newborn gift, add one of our ivory gift boxes with mulberry tissue, story tag and branded silk ribbon -please message to enquire. Alpaca improves with age. Our products will not always feel as soft and supple when new as they will with continued wear. Do not trust other “softer” alpaca products which may contain acrylic. This will initially give a softer feel, but it will pill and ball very quickly. Please follow these guidelines and you will enjoy your alpaca products for many years to come! Our exclusive yarn combines 70% finest micron baby alpaca with 30% bamboo viscose to create a supremely soft, silky yarn, less prone to pilling. It is harder wearing, drapes beautifully and while it remains uniquely insulating, it is more breathable, less “hairy” and therefore more transseasonal. It also washes beautifully. A cool handwash (30º) with a mild detergent such as baby shampoo is recommended. Wash for no more than 5 minutes. Rinse in lukewarm water, always pressing, not wringing the fabric. Wrap the item in a clean dry towel to absorb excess moisture. Reshape as necessary and lay flat to dry. Do not hang your wet alpaca garment as it will stretch. While it is possible to machine wash some of our garments on a 30º cool wash cycle, we cannot guarantee the result, because the make and condition of different washing machines varies too much! However, if you do wish to use this method for some of our smaller and less delicate items, we recommend you turn the product inside out and place in a gauze laundry bag. For very stubborn stains, please take your item to a professional dry cleaner. We recommend that all our alpaca products are folded or rolled, rather than hung to prevent stretching. For all our fur items, we recommend you use a wire pet brush to restore the fur. Day to day sweat and grime disappears with a good brushing and you will be impressed how easily your fur is restored. Avoid wearing perfume or hairspray if this might come into contact with your fur as the alcohol/chemical content can dry out the leather skin. Oils may also penetrate the fur and turn rancid. For more serious cleaning or for when liquids have been spilt on the fur, cover with talcum powder and gently but deeply rub in. Leave for an hour or two then brush away the excess. This will lift residues and dirt from the hair shaft and restore the fluffiness of the fur. For items like our fur rugs and cushions, you may prefer to get your fur/fleece product professionally cleaned by a furrier or fur cleaning specialist. However, for items like our fur trim gloves, fur pom pom hats and snoods, a cool handwash (30º) with a mild detergent such as baby shampoo is possible, although we recommend that you concentrate on sponging the fur clean and avoid letting the leather skin become soaked. Reshape as necessary and wrap the item in a clean dry towel to absorb excess moisture. Do not hang as it will stretch. The item must then be left flat to dry slowly and naturally, away from any direct heat such as a radiator, or the skin will go stiff and crispy. Only wash the fur as infrequently as possible as over time it will deplete the natural oils. The best way to store your alpaca (whether knitted or fur) is in a sealed, but breathable bag in a cool place. Never put it away dirty as perspiration, hair gel and food stains etc attract moths. To guard against moths in the knitted items, we recommend Cedar chips or balls as cedar oil is a known deterrent to moths, although do not store your fur with cedar oil as it can dry it out. Therefore, we recommend you store your fur in a very cold environment, but not in a freezer. Moths die when the temperature goes below 8º. Moths hate light and being disturbed. Their life cycle is about 21 days, so every month, we recommend you shake out your garment and leave in bright sun light. Larvae are strongly repelled by light, and will fall from clothing when they cannot find protection. Alpacas are not killed for their fur. The fur is mainly from baby Alpacas - or “cria” - which have died of natural causes as the weaker animals often perish in the harsh Andean winter. Alpacas can live for 20 years, promising a lifetime of shearing potential of far greater value than a single pelt.